There are many things in life we can neither control nor change. The only thing we can control, and change, is our own actions, and our reactions to these uncontrollable things. Almost a decade ago, when I was young and fancy free (and dinosaurs roamed the earth) I had a job that allowed (required) me to travel extensively around Europe. I would be based in a country for around 3 months, after which I would move on to my next “assignment” in a different country. It was all terribly exciting. I was, after all, pretty much without ties or responsibilities, and I was totally and unequivocally enthralled with Europe as only Europe can totally and unequivocally enthrall. This job also came with its own set of challenges. Nothing was constant. You had to learn to quickly adapt to and function in your new “home” – each with its own culture and ways and language and public transportation system. In all this, it was only too easy to sometimes become overwhelmed by things out of my control. It was also, in all this, that I learned to let go of that which I could neither control nor change — and focus on myself, and my reactions. I learned two important things: 1. To be able to be infinitely adaptable while, 2. Maintaining a central core which is constant no matter where I am…my inner compass. When I travel out of the country, this is one of the dishes I look for when I return. It is a taste of home, familiar and comforting. At the same time open to many adaptations. – Place the onions, olive oil, and vinegar in a bowl. Generously crack the black pepper over and sprinkle with sea salt. Toss to combine. – Lightly grease a baking tray and lay your tinapang bangus on it, open and belly-side up. 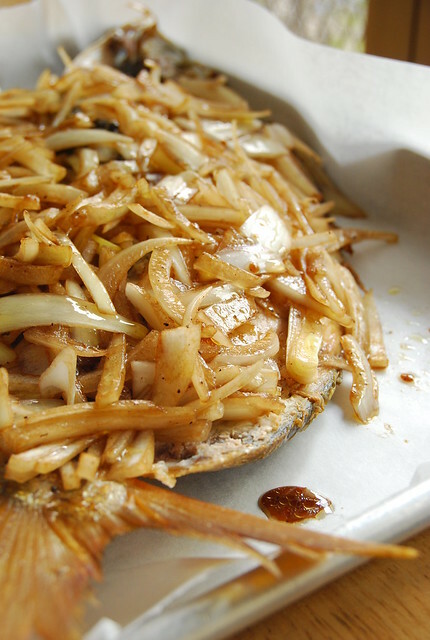 Pile the onions on the bangus. – Bake in a pre-heated 350C oven until properly heated through (the tinapa is technically already cooked) and the onions slightly softened. Bangus (milkfish) is one of my favorite fish. Over here, bangus is eaten in households far and wide, in many different preparations. You can have it marinated and fried (daing na bangus), stuffed (rellenong bangus), in sinigang (our famous sour soup), even bottled like Spanish-style sardines. You can buy them whole, but I like to get them already deboned (unlike most of the time when I prefer my fish whole) as their bones are like a network of feathers and quite difficult and tedious to remove. This fish’s smooth, black belly is rich and fatty and my absolute favorite part of the fish. Tinapa is fish that has been smoked, and this preparation of bangus it the one I like the best. 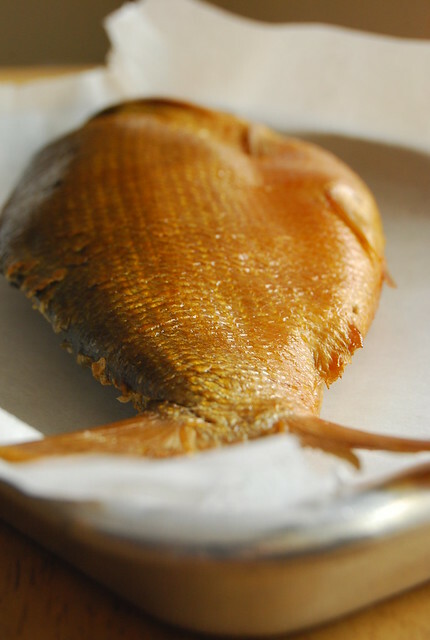 It is similar to any hot smoked fish, not just in its dusky flavor, but also in that it is already cooked. So preparing it is simply a matter of heating it up. This is my preferred way of preparing it, although not at all traditionally Filipino (what with the olive oil and balsamic vinegar). But like I said, this fish is open to many adaptations, and I think the soft, sweet onions complement the tinapa perfectly. I am far from having reached a perfect state of balance. Life is one continuous learning process after all. Sometimes things happen…plans fall through, things just don’t go your way, it rains and you wreck your ballet flats. And as much as I want to be that woman who goes through troubles with effortless grace and positivity, sometimes I am still that frustrated girl who needs to remind herself of lessons past. And sometimes I just escape into my kitchen, where I make the rules. wow i can only dream of travelling to Europe! By coincidence, we had tinapa for dinner together with your recipe for talbos ng kamote. Went so well together! When I was living abroad, my godfather would regularly send dozens of tinapang bangus from his company farm. (looks just like the one in your photo!) Each fish would come straight out of the suitcase wrapped in a sheet of newspaper. I would freeze them and have them steamed or microwaved and in ten minutes I had a taste of home. Still one of my favorite dishes ever. I don't know the equivalent of this fish here but it sounds delicious. Hi Ana! Nice coincidence! Glad the talbos went well with it…we sometimes have that very combination too 🙂 Lucky you to have a steady supply of tinapang bangus! I love travelling but travelling for work always tends to be different then travel for pure pleasure… 🙂 This dish looks totally amazing! Most yummy! Bangus is my all-time favorite fish, and I'd love to try it this way. What a lovely post! I completely agree with how our kitchens give us much comfort when things don't go as well as planned, or hoped for. And indeed, the best time to be in Europe is when you're young and carefree, when you know of no other dreams but your own.. then later come back with the persons whose dreams are one with yours. 🙂 Hope your week is a great one! Wow that looks like a really interesting dish! I don't know if my cooking skills are up to that level but I'd like to try! Thanks for this recipe–will try it. We love tinapang bangus too. On my breakfast plate I'll mix chunks of it with scrambled eggs, chopped tomatoes, brown rice then add a drizzle of truffle oil and pinch of sea salt. Perfect breakfast each time. what a coincidence, since tomorrow is ash wednesday, i was scavenging my freezer in search of fish and the only fish I have is bangus well it's not the tinapa kind though but I just thought it was just a funny coincidence. I always crave for bangus… tinapa or daing.. (in fact 2 blog posts ago, i had a post entitled cravings and yeah it was about my cravings for daing na bangus–haha!) Sorry I digress a lot and I think I'm just distracted by your golden tinapang bangus… and I want some right now! I agree that there are times when things really spin out of control for us and the least we can do is learn from the experience. This entry actually hit a nerve with me as things have been more than a little mad in my neck of the woods of late! Tinapang bangus is always a treat, but may I also recommend the charms of tinapang tilapia? This specialty of Bataan province is deliciously smoky yet surprisingly delicate as well. Hi Anonymous! Hope you like it! Enjoy the market! Hi Weekend Gourmet! So well put 🙂 Both about the comfort of our kitchens and “knowing no other dreams but your own” in Europe! Hope your week is going well! Hi Marivic! Sounds like a wonderful breakfast…I will try that! I’ve mentioned my travels here and there on my blog. It has certainly shaped the person I am now! Hi Midge! I have had tinapang tilapia, yes from Bataan! Definitely delicious! We went to the market there during one beach trip and it was heaven for me with all the tinapa, daing, and tuyo (I imagine not so delightful for others!) 🙂 Hope things are looking better in your neck of the woods! Hi Anh! Hope you are feeling better…hang in there! That looks so exotic! I'm very very intrigued! Came to your fabulous blog by way of your comment on Sweet Tooth's post about Texas sheet cake. Even though it's rude to say so, MY Texas sheet cake is better than the one from Cook's Country (Don't get me wrong, I love Cook's Country, but … )! This fish dish is so different from anything I've seen. I will definitely be coming back to your blog when I get ready to cook some fish. Fish is the only thing I like that I don't cook very often. I'm sure I can get some great tips from your blog. I love tinapa. Fried, with a cold ensalada on the side and hot steaming rice. There's just something so comforting about its taste that i never really tire of it. My mom used to get this particular smoked dilis before at cash n carry. they fried up crisp, but had ths wonderful smoky flavor. ever since cash n carry got renovated, i have no idea where to get that dilis 🙁 i miss it! Nayna! You made me laugh out loud with the likas papaya soap and cotton pads (??)..hihihi! There is really something in the taste of tinapa that just hugs you…I love it too. That smoked dilis sounds amazing…hope you find it again, and if you do please let me know! Wow, travel + bangus in one post = two of my favorite things.